It’s officially cold as heck now, and as such, I need to start drinking Canuck whisky again. Why? Because I’m one of the vast majority of Canadians who lives close to the border but pretends like the cold I deal with is the equivalent to the Yukon. Recently I was asked if I could do some Canadian full bottle trades with /u/GWCad . Unfortunately due to holiday shopping and some pretty rough shipments, I’m not really doing full bottle swaps anymore. Contact him if you’d like, I think he’s still looking for someone to swap with. 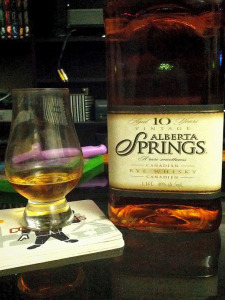 However I did offer to go out and try one of the Canadian Whiskies requested, Alberta Springs.